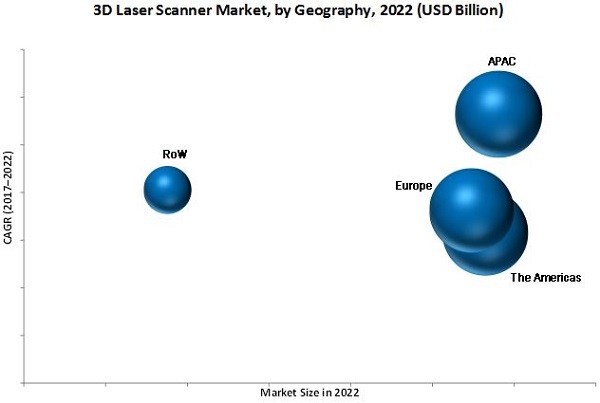 [163 Pages Report] The 3D laser scanner market is expected to be worth USD 3.74 Billion by 2022, growing at a CAGR of 8.18% between 2017 and 2022. 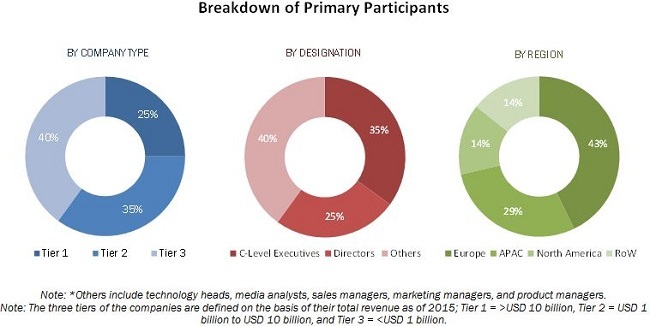 The objective of this report is to define, describe, and forecast the market size and growth potential of the 3D laser scanner market across different segments such as range, product, offering, application, end user, and geography. It includes the forecast of the market size, in terms of value, with respect to four main geographies, namely, the Americas, Europe, APAC, and RoW. The study identifies and analyzes the market dynamics such as drivers, restraints, opportunities, and industry-specific challenges for the market. It also profiles the key players operating in the market. The base year considered for this report is 2016, and the forecast period for the market has been considered between 2017 and 2022. The growth of this market is driven by factors such as the high level of quality control and inspection standards offered by 3D laser scanners, significant deployment of 3D laser scanners in various industries, and the emerging market for 3D printers across the globe. The value chain of the overall 3D laser scanner market includes various activities and factors that help achieve a high level of performance with respect to a service or a product. The key players operating across the value chain of the market are FARO Technologies, Inc., (US), Hexagon AB (Sweden), Creaform (Canada), Perceptron, Inc. (US), Nikon Metrology NV (Belgium), Trimble Inc. (US), Topcon Corporation (Japan), 3D Digital Corporation (US), Riegl Laser Measurement Systems GmbH (Austria), and Carl Zeiss Optotechnik GmbH (Germany). According to the MarketsandMarkets forecast, the 3D laser scanner market is expected to be worth USD 3.74 Billion by 2022, growing at a CAGR of 8.18% between 2017 and 2022. The major drivers for the market include the high level of quality control and inspection standards offered by 3D laser scanners, significant deployment of 3D laser scanners in various industries, and the emerging market for 3D printers across the globe. The report covers the 3D laser scanner market on the basis of range, product, application, offering end user, and geography. The study identifies and analyzes the market dynamics such as drivers, restraints, opportunities, and industry-specific challenges for the market. It also profiles the key players operating in the market. The quality control & inspection application held a larger share of the 3D laser scanner market in 2016. Quality control is an integral part of production process as it leads the production to run smooths and without incurring any extra cost. In the quality control & inspection application, 3D laser scanner is used for alignment, CAD-based inspection, dimensional analysis, and machine calibration, among others. Manufacturers have a robust inspection process to improve quality. Manufacturers use 3D laser scanners for accurate 3D scanning and inspection analysis to determine the corrective action without slowing down the production. On the basis of end users, the automotive sector held the largest share in 2016, while architecture & construction industry is expected to witness the highest growth highest rate during the forecast period. The architecture & construction industry is gradually evolving and state-of-the-art solutions are being adopted to execute giant construction projects such as construction of bridges, multistoried buildings, expressways, and industrial plants. 3D laser scanner is a safe and fast way to capture the as-built information required for bridge and road design, monitoring, and inspection. The 3D laser scanner market is dominated by the Americas; however, APAC is expected to grow the highest rate during the forecast period. The highest growth rate in APAC is attributed to the rising number of engineering and infrastructure projects, increasing preference for custom implants in medical applications to ensure better and faster recovery, and increasing number of dental restoration surgeries. The complex 3D scanning software and huge data storage concerns may pose a challenge for manufacturers in the 3D laser scanner market. The major vendors in market are FARO Technologies, Inc., (US), Hexagon AB (Sweden), Creaform (Canada), Perceptron, Inc. (US), Nikon Metrology NV (Belgium), Trimble Inc. (US), Topcon Corporation (Japan), 3D Digital Corporation (US), Riegl Laser Measurement Systems GmbH (Austria), and Carl Zeiss Optotechnik GmbH (Germany). These players adopted various strategies such as new product launches and developments, contracts, acquisitions, partnerships, and business expansions to cater to the needs of the market.